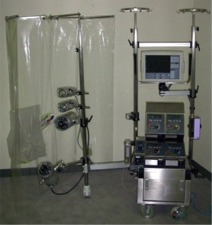 Used with a flat sheet type bubble oxygenator. 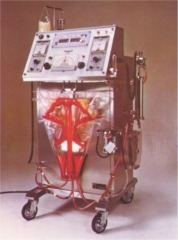 Only heart lung machine, at that time, to be able to accommodate with a Kolobow membrane oxygenator. 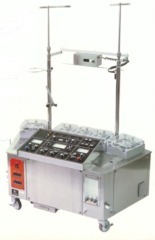 Reengineered 5 pump system which are positioned in front of the operator. 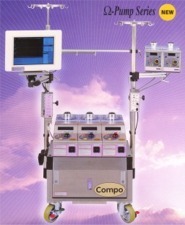 6 pump system with the optional auto recording system. Pioneer in the auto recording system development. Component system setup. Flexible layout. Pulsatile flow control is incorporated. Patented alpha-shaped pump sleeve. 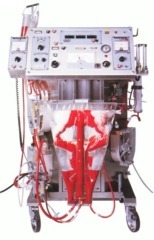 Patented omega-shaped pump sleeve can minimize the hemolysis. Removable pump head from the controller. 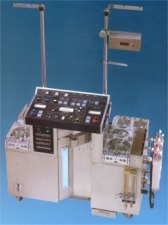 Dedicated sterile sheet which incorporates the CPB tubing circuit. Extremely low priming volume setup.